Being a full-time artist means that you have to save time and money any way you can. I’ve compiled a few of my favorite tricks and gadgets to help your creative process go easier, faster and cheaper! Hands down my favorite item in my studio- and cheapest! 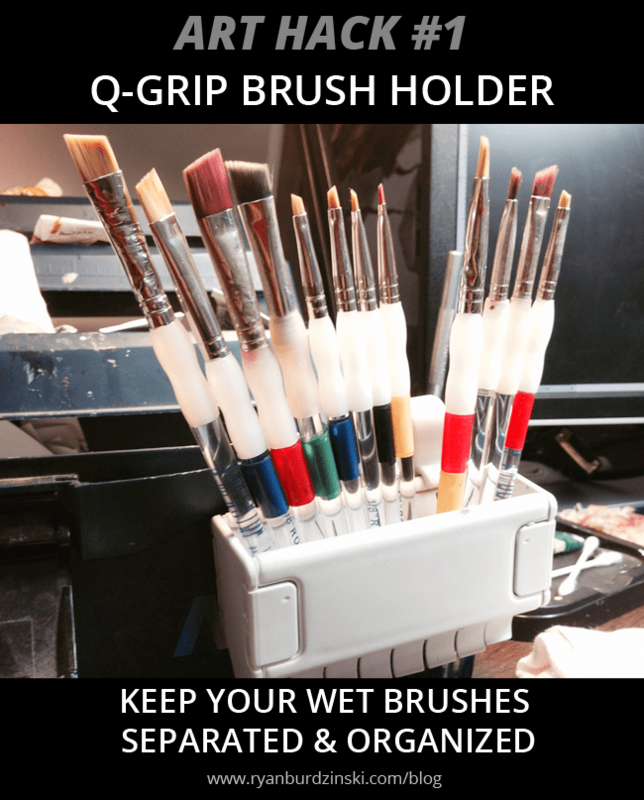 Perfect for artists who paint with many brushes and having trouble finding were to put them down. I liked mine so much I bought 2 more. Every artist should have this or something like it! Definition: tab·ou·ret \ˌta-bə-ˈrā\ : a small portable stand or cabinet, with drawers and shelves for storage. 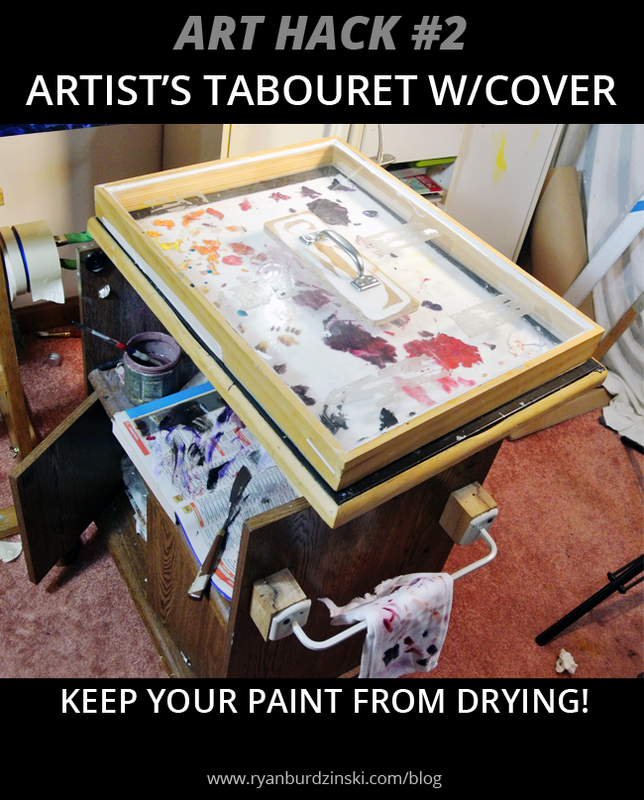 Artist’s tabourets usually have a palette on top, and drawers for newspaper, rags, etc. Mine was fashioned from an old portable swiveling TV stand. We removed the top piece, (but kept the swivel mechanism) then placed in a piece of glass inside with foam core backing, held together with duct tape. The real “art hack” here is the cover, made custom by my father. It is air-tight and keeps the paint from drying for a few extra days. Why buy rags when some person silently delivers these to your home for free? Great for cleaning off knives and brushes. You might think the ink from the pages would dirty your brushes, but you can’t tell- trust me. 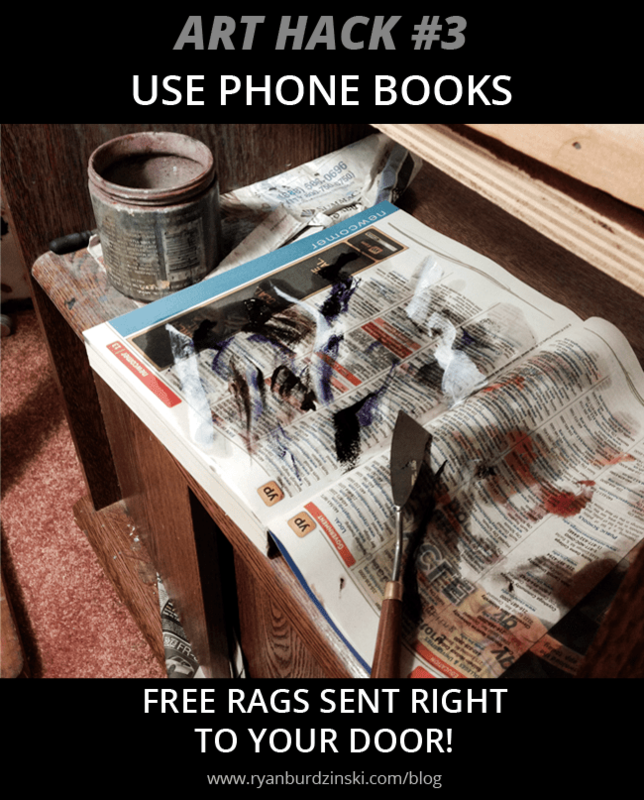 I still buy white rags (Home Depot) but barely use them anymore after adopting the technique! For years I wasted time and money printing full color sheets and taping them up somewhere around my easel. Just a few years ago I was able to aquire a spare Dell monitor and a 25ft monitor cord. I use it as a second display for my iMac, which is on the other side of the room away from the messy paint. This way I can make changes instantly and zoom in to more detailed parts instead of printing them out. *Don’t want to buy extra computer monitor? You can make almost any newer TV a spare monitor with the right adaptors! Comment below and I can help you out with what you need to buy to do this. Okay, the iPad is not cheap at ALL, but the app is only $4.99 and extremely valuable so hear me out. 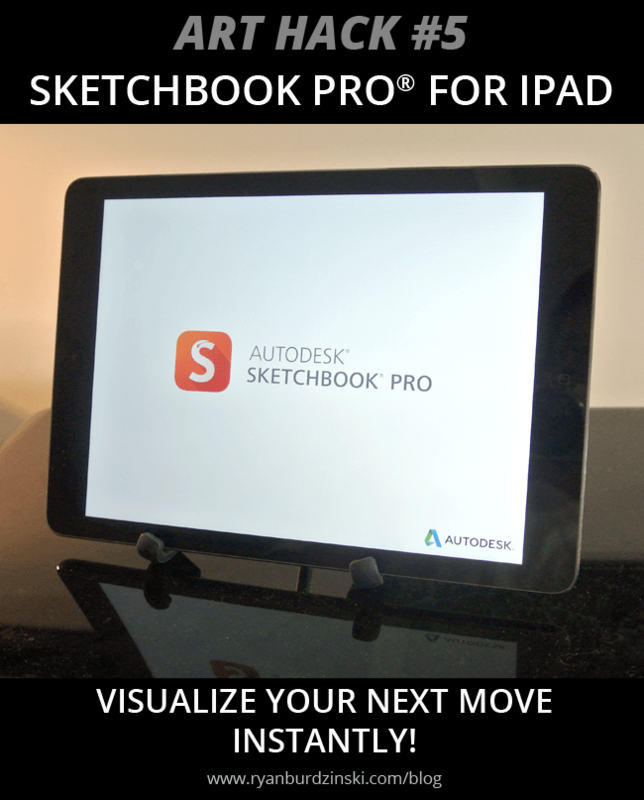 I’ve tried out many drawing and sketching apps for iPad and this is my favorite one. It has the most options & brushes, and has a camera built in. This way, if you want to see how a new idea would look in your painting, you can snap a picture and draw directly over your painting to test it out. It even has layers where you can adjust opacity, and can export to a layered Photoshop file which I feel is the strongest feature of this app. You will need a stylus as well. 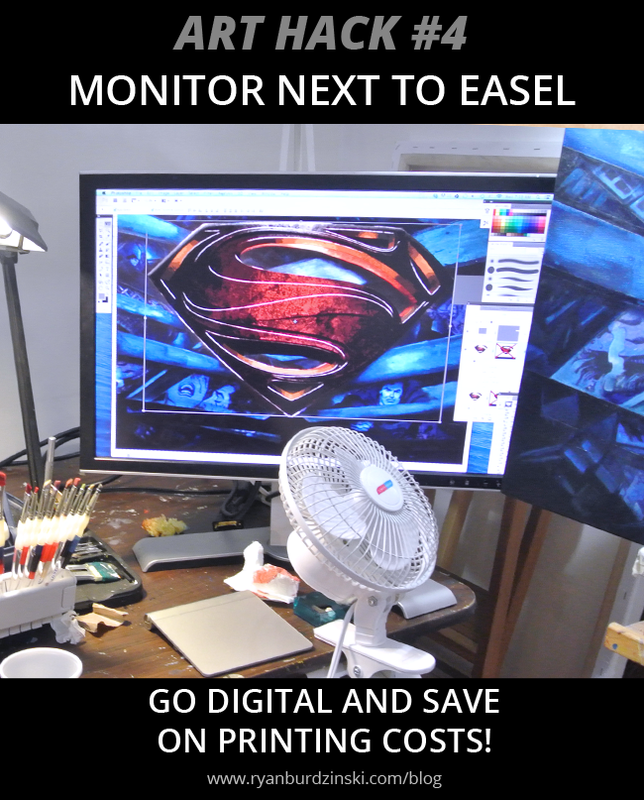 Want more Art Hacks? Think this post can help someone you know? Have a question? Please comment below and share with your artist friends!